BRENHAM, Texas -- At least one person has died in Texas and three are missing after torrential rain caused floods that closed roads and schools, prompted evacuations, damaged homes and forced dozens of students to spend the night on campus, officials said Friday as they braced for more rains later in the day. "It's not going to take very much rain to get us in those flood stages again," said Washington County Judge John Brieden. 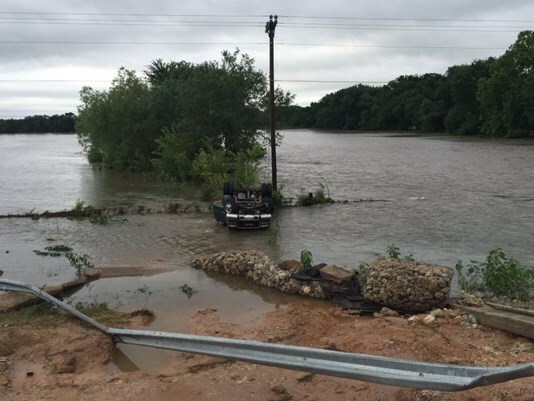 Brieden said that in Washington County, located between Austin and Houston, one person has drowned and another person was missing after their vehicle was swept away. Brieden, who didn't release details on the circumstances of the drowning, said they had not yet determined if a second person who died in Washington County had died from drowning or a heart attack. The missing man was identified by family members as 21-year-old Darren Mitchell, CBS affiliate KHOU reported. Mitchell called his sister Thursday evening to tell her he was trapped in high water. "He just said he was alright and he made it out of the truck," Ro Mitchell told KHOU. But in a haunting Facebook post at 6:29 p.m., Mitchell shared a photo of from inside his submerged truck and wrote "And all I wanted to do was go home." Friday morning, relatives found Mitchell's truck overturned in water near Highway105. He wasn't inside. "I want my grandson. I want to put my hand on him. I want to know he's here with me," Roberta Washington, Mitchell's grandmother, told KHOU. Washington said she was still holding out hope that Mitchell made it to safety. "Where is he? Why isn't he calling us saying come get him?" Washington asked. Emergency crews searched the water but found no sign of Mitchell. They had to temporarily call off the search when another storm moved in. Meanwhile, an Austin-area official said two people were missing from a vehicle there. "We had one guy that got out of his vehicle and managed to hang on to a tree while the vehicle washed away," Brieden said, adding the man was in the tree for a couple of hours before being rescued by a boat crew. The county seat, Brenham, received 16.62 inches of rain on Thursday, breaking the city's daily rainfall record, said National Weather Service meteorologist Wendy Long. "What we got was more and more rain, harder and harder rain," said Brieden. He said about 40 children spent the night at a Brenham elementary school after buses were unable to get them home. He said that in some areas buses couldn't get down flooded roads. A couple of buses had to be rescued as one broke down and another that was trapped when waters rose nearby. Lisa Block, an emergency services spokeswoman in Travis County, which includes Austin, said up to 9 inches of rain fell in parts of the county overnight. Residents in one neighborhood were asked to evacuate their homes, while those in another were advised to shelter in place, she said.